only the best from all currently available auto-backlight solutions and adds many extras. ThumbCal is a finger friendly calendar and tasks application for your Pocket PC that lets you use without the need of stylus. With simple gestures you can slide through days, weeks, months and years. ThumbCal lets you organize your appointments and tasks very quick and simple. play fluid and enjoyable. SokoSave Mobile features crisp, simple graphics and intuitive game controls. - VGA, QVGA, SE_VGA, and OzVGA video mode support; portrait and landscape orientations. 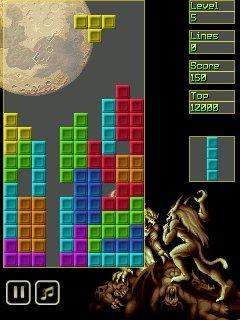 - High-resolution, scalable graphics allow small and large puzzles to be played comfortably on handheld devices. - Plays classic Sokoban puzzles, as well as Multiban puzzles. - Computer-assisted movement and intuitive game controls. Simple screen tapping actions move objects automatically over long distances and complex paths. - Unlimited undo and redo. - Automatically saves and restores game positions. - Highlights legal moves and pushes. - Puzzle browser with preview. Recognizes puzzle collections stored one per file, several per file, and in ZIP archives. 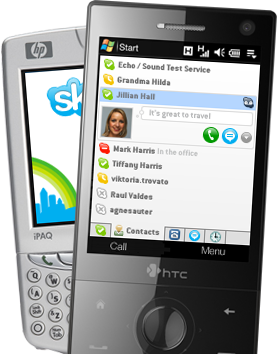 Skype is the next phenomenon from the people who brought you KaZaA. Just like KaZaA, Skype uses P2P (peer-to-peer) technology to connect you to other users – not to share files this time, but to talk and chat with your friends. The technology is extremely advanced – but super simple to use... You’ll be making free phone calls to your friends in no time! PhatPad is an advanced notes organizer for Microsoft Windows Powered Tablet, Desktop and Pocket PCs. 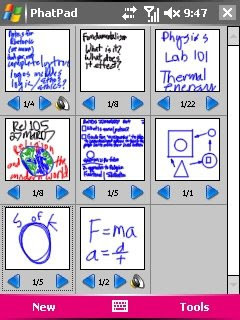 It allows you to draw pictures, jot text notes, or put a mixture of pictures and typed text on a virtual scratch pad. The program uses new digital ink technology, which provides a very smooth ink flow, so it feels like you’re writing on a piece of paper. While working with the note editor, PhatPad offers standard editing commands, such as Undo, Redo, Cut, Copy, Paste; 25%-200% zoom and special Fit to Screen mode; Draw, Select, Erase, and Change modes; customizable pen palette; variable pen width; customizable toolbars; variable page size; and page preview mode. You can export your notes and drawings as bitmap, JPEG or PNG images, email them as file attachments, and transfer them between Pocket PCs via infrared. In addition, PhatPad allows you to store up to 1,000 pages containing a mix of handwritten text, drawings and printed text per single file and add an optional memo, a background image, and a voice note. 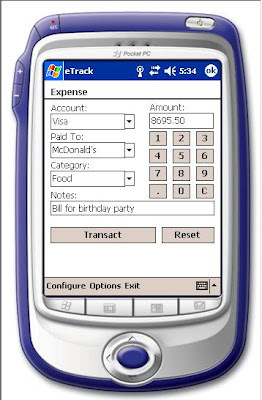 You can use the Pocket PC navigation button to browse multi-page documents and zoom in/out, or to scroll the current page depending upon your preferences. A glance at some Iran's major attractions. Includes 78 Historical attractions and 37 Natural attractions. 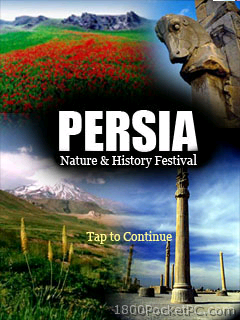 This application travel you into the ancient land, Iran, and its wonders. 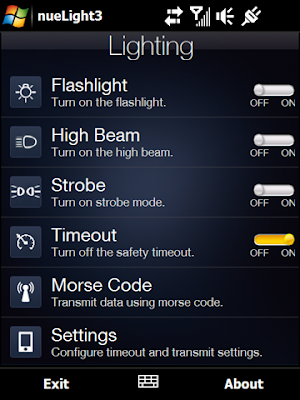 nueLight turns your device into a versatile flashlight. 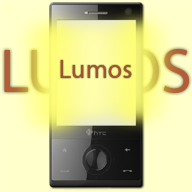 nueLight uses the flash LED for the camera and can even enter high-beam mode. nueLight also has a morse code function where it will send text you type as morse code over the flash LED. To use the locking mode, let go of the app button (default: voice command) and quickly tap the lock button (default: comm manager). Warning: Overriding the built in safety timer can burn out the flash LED. Use at your own risk. Pocket Tunes is the easiest-to-use feature-rich music player for Palm and Windows Mobile smartphones and PDAs. Try it today to find out why hundreds of thousands of customers love it! 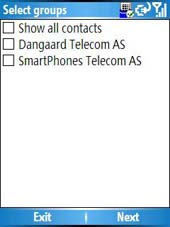 Send the same SMS to a group of contacts. 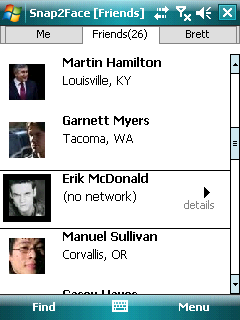 right menu in the messaging application. The application reads the categories from the Pocket Outlook database. If you own a Smartphone, you have to create the categories in Outlook and sync them to your device. 3. works with WM5 and WM6. 4. Seems to be moderately paced as it is written using managed code but does the job well. Manage your budget with Amount Spent & Amount Earned. Filter Cash Flow which are expense or income easily. toggles GPS on and off as opposed to checking for nearby contacts in your address book and doing tons of things (which helps conserve memory and battery life). 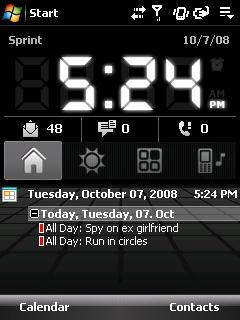 This program does for you the one thing: it will send SMS reply to the Caller of missed phone. This program is a clever (just a little): it will send only one message to the Caller whose number repeats. This program runs in background completely. To turn it on/off you will simply have to launch this program again, and check/uncheck Active option. AC time tools helps you to monitor and measure time with alarms. 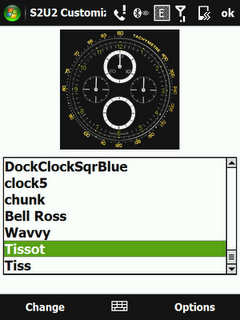 Virtually unlimited number of stopwatches, countdowns and t-minus instances. Stopwatch and countdown do not have time limitation, they can go over 24 hours. Money 2008. 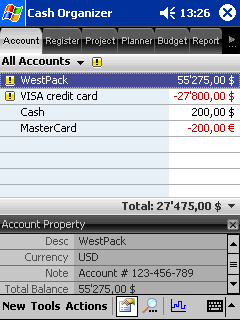 This is Inesoft Cash Organizer, a powerful financial manager in your pocket. * Change Analog Clock Face. * Change Analog Clock Hands. * Change Slide to Unlock Text. * Change Answer, Ignore Text. * Change Slide to Answer Text. * Hide/Unhide Clock & Hide/UnHide Date. * Add or Change sound to play on Lock & Unlock. * Add or Change the application to run after unlock. * Export & Import S2U2 Themes. S2P is a stylus-free MP3/WMA player application. It simply lets you browse your music files & play them. It fully integrates with S2U2 & supports A2DP & AVRCP as well. Pocket Finance Diary is a simple financial manager for tracking expenses. Using Pocket Finance Diary you will have more income available, and you will perform your expenses in a more efficient manner. 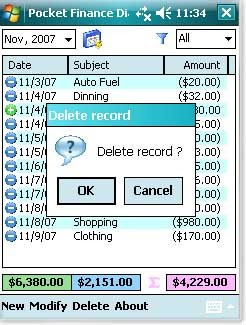 - Expense or income records can be easily added, edited or deleted. - The current date is always preselected. 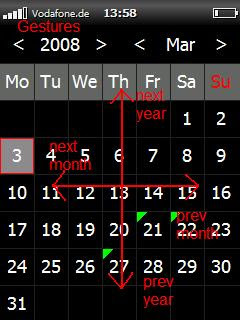 - Using drop down menus, the user can select the date. - Filter Cash Flow which are expense or income easily. - Display the summary of the transactions. Record and document your personal data or any other information you want to keep from prying eyes. WARNING NeoPocketDiary uses 128bit encryption. Encryption is illegal is some countries. Please check your laws before downloading. The program name says it all - now you can unzip a file enclosed in a mail message, files, downloaded from Internet - simple and easy - unzip any ZIP file! Do you like chatting with people you don’t know? Do you want to be able easily share multimedia files with your friends? Do you hate the cost of MMS? Well now you can do it all via BlueTooth? 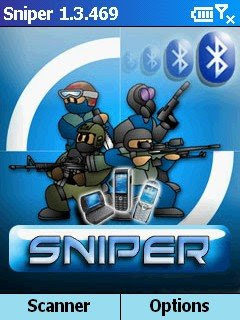 Find your target, take aim and let Sniper do the rest! messages. With just a few clicks you can designate folders (on the storage card if you wish) for Music, pictures or any kind of file. Sniper is skinnable and comes with a range of cool skins. sending out Business cards at meetings! Since BlueTooth is short range 10-12 meters and does not use a Wireless carriers data network, all this messaging and data transfer is FREE. It's a plugin designed to work with the great freeware media player TCPMP, that lets you play flash video files (.flv). - A program to download YouTube movie by Pocket PC and PC. - A TCPMP plugin to play flv file directly on Pocket PC (the plugin will never support CorePlayer). - Taping on the "Options" menu item. - Choosing the "Settings" menu item. - Tapping on the "Select Page" button (lower right). - Selecting the "File Associations" menu item. - Selecting/Checking "M3U playlist files (M3U)" from the list. - And then finally tapping the "OK" button. * Then just visit http://www.mobytube.net with Pocket Internet Explorer (or Opera Mobile or other web browser that lets you download/launch files). * Search for a video, once you find one you want to play, click on the video to download/launch the .m3u in TCPMP. * Depending on your settings in TCPMP you might have to click the play button to start streaming the video. Task Facade is a graphical task-switcher that shows all running programs as snapshots (Vista-style). Just map it to some button, then reboot. The main aim of the Task Facade project is to get the functionality similar to Dynamo 2, but with enhanced performance. RichesseGPS is a small navigator for geocaching. It allows you to approach caches very closely. - Tap + to add your own point (waypoint, cache, etc.). If the GPS is connected, current coordinates will be used. - Tap - to remove selected items. - Tap Info to see more details about the selected item. - Tap Import to import LOC, GPX or OV2 file. - Tap Select to navigate to the selected item. - To Export, select items to export, then tap'n'hold on the selected items. - This page shows you direction to the cache, distance from the cache and speed your are currently moving. If you are standing still, then the speed and direction is not precise. You need to move. - This page shows some information read from GPS like position, satellites, etc. 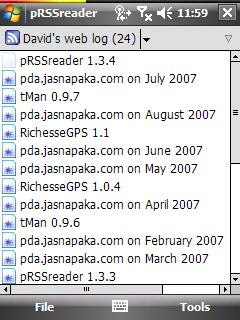 · Small - RichesseGPS takes about 103 KiB of your PDA memory. 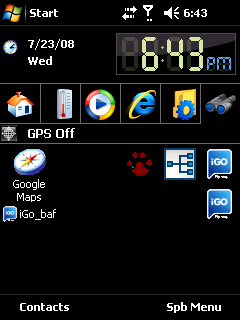 · Hi-DPI aware - RichesseGPS is designed in modern manners, it is ready for VGA displayes. 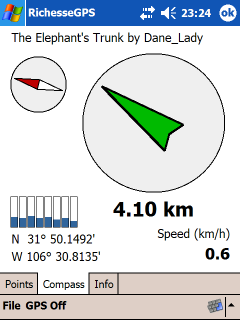 · Compass - RichesseGPS shows you the distance from the selected cache and the speed you are approaching the cache. · Import - RichesseGPS can import LOC and GPX file formats (available from geocaching.com). It can also import OV2 files. · Export - Export your POIs and exchange them with your friends (from 1.1). · Cache status - You can mark your caches with three states (Not completed, completed, not found). · GPS Coordinate Format - You can change between three types of GPS coordinates (DD.DDDDDD, DD MM.MMMM, DD MM SS.SS). 200 MHz processor (ARM based). 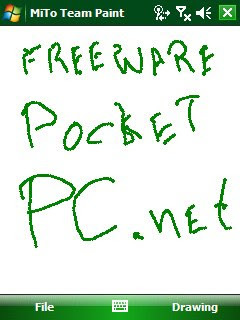 Small program for Pocket PC that allows you to draw pictures like on paper. Program is VERY simple. It allows you to draw with different pen colors and line widths. After that you can save your picture to BMP-file. It was written in an couple of hours just to test .NET Compact Framework v2.0 capabilities. 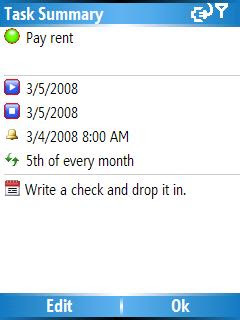 TodayAgenda for Pocket PC displays appointments and tasks on your today screen up to 30 days in advance. It replaces the default Outlook plugin with a lot of more features. - ARM and XScale processor. - Pocket PC 2003, Pocket PC 2003 SE, Windows Mobile 5.0. Windows Mobile G-Sensor and Light Sensor Enabled Alarm Clock. 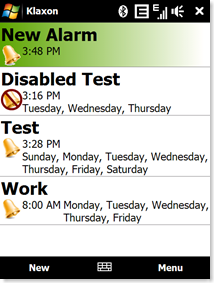 Klaxon is a Windows Mobile G-Sensor and Light Sensor Enabled Alarm Clock application. Using Klaxon is pretty straightforward; it's more or less like the standard Clocks and Alarms application. * Flip your phone over to snooze. * Shake your phone to turn the alarm off. 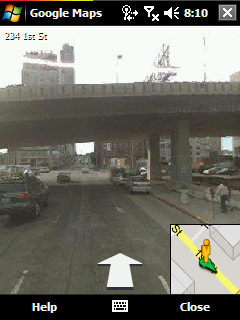 Take the power of Google Maps with you on your mobile phone. Real-time traffic — See where the congestion is, and estimate delays in over 30 major US metropolitan areas. Detailed directions — Whether you plan to walk or drive, your route is displayed on the map itself, together with step-by-step directions. Integrated search results — Local business locations and contact information appear all in one place, integrated on your map. Easily movable maps — Interactive maps let you zoom in or out, and move in all directions so you can orient yourself visually. 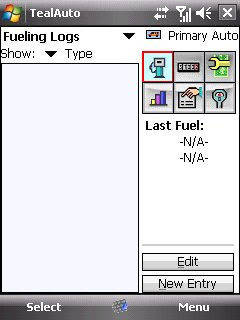 Commander lets you browse and scroll a Pocket PC interface, launch applications by recognizing and responding to the sweep of a finger across the screen. The folks over at GX5.com sent a press release over for their new product, Ultimate Search. Ultimate Search functions as a homescreen plugin and searches a variety of online services. They have a trial version so try it out. When you are on the go, the faster you can get the information you need, the more efficient and productive you are. To achieve this, Gx5 introduces UltimateSearch, a today screen plug-in that gets you the information you need in the fastest possible manner. This beautifully designed search gadget gives you instant access to all the key search engines you need to access when you are on the move. Search Engines include Google, Local Business and Services, Yahoo oneSearch , Wikipedia, Answers.com and many more. UltimateSearch gives you pin point accurate results because we have sensibly divided your search into specific categories. Not only do you now search sensibly, but you will be searching smarter. Food Database lets you work out exactly what you need to do to shed pounds quickly and effectively. successful at controlling their weight. 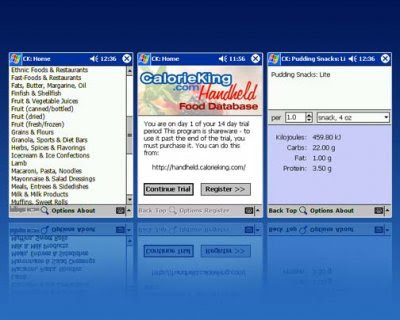 Now with the Food Database for your Pocket PC it's always easy to carry the information you need in order to better understand the food you eat. · 50,000+ food database! Largest and most comprehensive available! during synchronization process with compromised PC. Touch HD (in WVGA), Diamond and Touch Pro (in VGA) and with the Touch Viva and Touch 3G (in QVGA). * Added compatibility with 16keys Hardware keyboards. * Added compatibility with 20keys Hardware keyboards. * Added compatibility with Full Hardware keyboards. * Added full key remapping capabilities to Full Hardware keyboards. * Added T9/ABC functionality to Full Hardware keyboards. * Restored DeadKeys functionality to Full Hardware keyboards. * Added compatibility between 16keys Hardware keyboards and some apps extracted from the new Manila2D roms. * Improved compatibility with third-party browsers. * Fixed the "white items" issue in the list of available languages. * Added compatibility with French Qwerty, Hungarian, Romanian, Slovak and Turkish Language Packs. * Create and Modify tasks in the device. Get your life under control with ListPro! Ilium Software's ListPro lets you do everything from simple checklists to detailed databases. From grocery shopping lists and birthdays to CD collections and reference guides, ListPro can do it all. - Make a to-do list in just 3 clicks or build a customized database! This program is a touch driver to handle the touchscreen presses and vibration. TouchResponse will vibrate on touch. A settings program exists to configure how the vibration works. Since this is a touch driver, there is no program you need to run to start it. 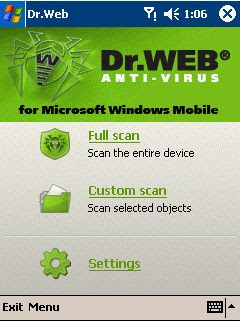 It has been tested on an HTC Touch and HTC Touch Pro for several days with several stability issues corrected. - Variable duration of vibrate. 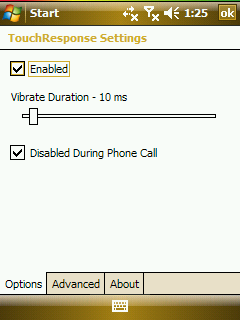 - Disable during Phone Call option. - Disable when phone is on silent. - Settings Program- Settings->System->Touch Response Settings. Use TealAuto to record all your car, truck, or motorcycle fueling, trips, and service stops, and then generate reports and graphs based on those records. 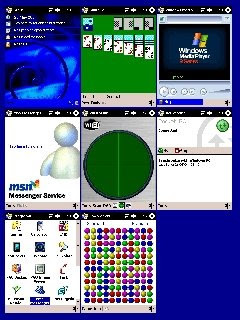 Mobile, PalmOS, and as a desktop version for Windows PC. Most comprehensive fakeing solution for protect your private SMS! Stable your family! Peace-Keeping in your family! This small program is a useful tool for aviation professionals that need to have an accurate calc of Moon phases and Sunrise/Sunset times. 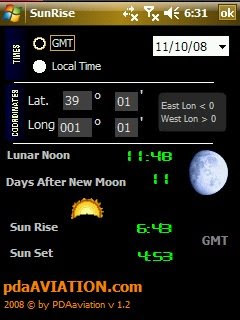 Freeware to calculate sunrise,sunset,lunar noon and lunar phase depending on your coordinates and selected date. 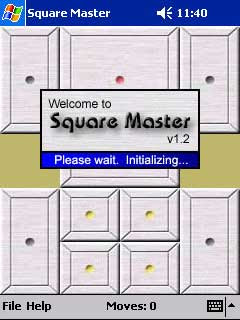 Smartfall is a freeware game developed to support the HTC Magician (iMate Jam/MDA Compact/XDA II mini/etc.). The "Jam" is a Windows Mobile 2003 SE device. 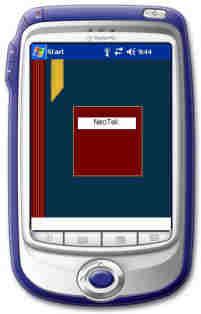 Smartfall was also tested on the IPAQ 5450. We hope that this game will work on all Pocket PC Devices (2002 - 2003 SE). However we will not be able to support Windows Mobile 2005 until we are able to have a test device for that platform due to the difference in support for the VGA resolution. If you come across any device where this game doesn't work we would appreciate your feedback. 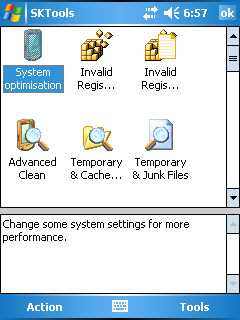 Registry optimization for WM5 New! Search and replace in Registry New! Delete ALL contacts, appointments, tasks, messages option New! Change the location of PIE cache, PIE history, PIE coockies, AvantGO data, NetFront cach, Messaging (outlook) files New! handwriting recognition software has been optimized for better performance on the latest Windows Mobile devices and features a reduced memory footprint. - Write Pad Soft Input Panel (SIP).